Orange Nitrile gloves offer incredible levels of grip, wet or dry. Take a look at that aggressive texture! 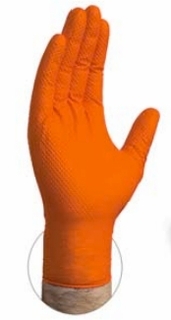 This is the glove for your most demanding jobs, and the high visibility orange really stands out. 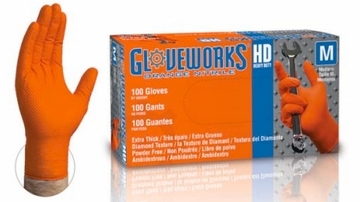 Better performance, better protection, and better safety; the GloveWorks Orange Nitrile glove. Powder Free Industrial Nitrile Orange Diamond Textured Gloves. Eliminates skin irritation associated with glove powders Nitirle gloves are a latex free solution for individuals concerned with latex sensitivity.